Mushroom Barley Soup doesn’t have to be that staunch bowlful of murky stuff that your stepfather eats out of a can all winter. In fact, it can be downright right spring-like, with bright flavors from fresh herbs and springtime’s bounty of veggies. Sure, I could have found some way to garden in Brooklyn, but I lived there for most of my life and never managed to. I feel like if something leads me back home someday, I’ll be well equipped to put together some sort of garden, but growing up in the city it always felt like a dream that was way out of reach — something a much more put-together, much more resourceful or much richer person did. Now that I’ve lived both in Oregon and Nebraska, I get it. The space helps for sure, but the pace helps, too. And I’ve come to find that there’s hardly anything more satisfying than grabbing a handful of thyme right off the porch, or gently pulling off a few crisp leaves of basil. The little things; tucking tomato plant branches safely into their cages, then smelling their grassy perfume all over your hands, eating a strawberry still warm from the sun, and even the failures! Watching your sunflowers go from seven to four and discovering the bunny who did it is still a pretty cool feeling. And so this afternoon, when I got a yen for some mushroom barley soup (even though it’s June), I was able to use my garden instead of my spice rack. I am definitely a year-round soup girl, and can be found simmering some on even the hottest days of the year because sometimes gazpacho just won’t do. If you don’t happen to have all of the herbs growing right outside, you can just use a mix of whatever you do have on hand. And if you had to choose just one herb, I’d probably make it dill. You can also bulk it up with beans – chickpeas or black-eyed peas are good contenders – or even some sauteed cubed tofu or tempeh. Tender greens, like spinach or watercress, would also make nice additions if you haven’t filled your greens quota for the day. Preheat a 4 quart pot over medium heat. Saute the onion in olive oil with a pinch of salt until translucent, about 5 minutes. Add the mushrooms and zucchini, and cook until slightly softened and some of the moisture has been released, about 5 more minutes. Mix in the garlic and saute for a minute or so. Add celery, tomato, barley, broth, pepper and salt. Cover and bring to a boil. Once boiling, reduce heat to a simmer, add herbs, cover again and cook until barley is tender, about 10 minutes. Salt and season to taste. For best results, let it sit for at least 10 minutes uncovered so that the flavors can marry. Serve garnished with extra herbs. Fresh herbs make everything better. My go-to is rosemary. Yum. I so identify with this (both the soup and the herbs)! I am going back to apartment living and going to miss my garden so much. I just discovered your blog and love it! 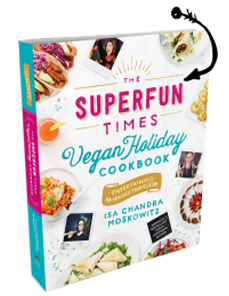 Thanks for the great vegan recipes! Isa, seriously, thanks so much for this. I always wanted to start my own l’il garden when living in Atlanta, but was always too lazy to. And now that I have a house and as much green space as I can handle, nothing beats plucking your own herbs and harvesting your own veggies. YAY. Isa, I get it. I moved the NY to Vermont, and I haven’t seen the rabbit yet, but I know he’s there along with an assortment of other 4 legged lovelys that really enjoy raiding my bird feeders..and I enjoy watching them. My garden keeps getting bigger. LOVE this recipe. It may be June, but it’s always the right weather for a good soup……..thanks. This looks like my kinda soup, yum! Do you think Bulgur would work in this recipe in place of the barley? Or would it be totally awful? This looks like a fantastic soup – even if it is a balmy 80 degrees here in SE Iowa! So glad you are giving the Midwest a good name. People ask why we live in a college town in Illinois and don’t move to Portland or back to DC and some days I ask myself the same thing. The pace here is way too easy and hard for me to give up. I don’t mind being the lone or one of the few vegan families in town because I can grow my own food and have time to hang out on our porch. 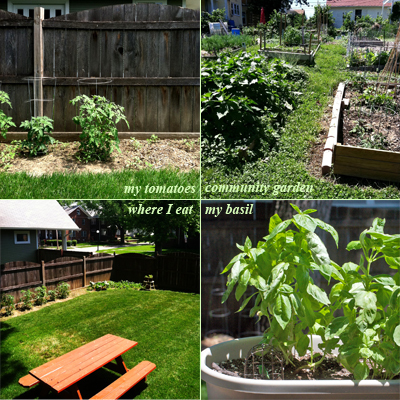 Love your garden! Same reason I moved to Omaha when I could have stayed in Southern California or moved back to Portland. I have to say your Basil looks more advanced than mine does right now. My dill and cilantro are coming on like champs though! If only I can figure out what is taking a toll on my onions this week. I think it is just the wind, but am not positive. My potatoes are doing great though along with the tomatoes and various peppers! I’m not a big mushroom fan (I know, sad thing for a vegetarian huh), but I can relate so much to what you say about gardening 🙂 Growing your own veggies and herbs is like a little bit of heaven! This looks amazing! Now I have a great recipe for my cooking-tuesday this week! Greetings from Mexico City, gracias! Just made this- amazing!!! Didn’t have fresh thyme but threw some parsley in. Very flavorful! I added white beans and had to let it simmer for about 25 mins to cook the barley all the way. Excellent recipe- boyfriend approved and def a keeper! Thanks !!! I made this for lunch yesterday and it is delicious! My (non-veg) mom loved it too. Definitely a keeper! Thank you! Start a meal with soup. That is amazing to me. SOOOOO good!!! Added a little chard, all the herbs in the recipe (I’m growing them all!! ), and also some pineapple sage because I had it. My carnivore husband asked me to make this again. Community garden in Omaha say whaaaa? Tell me more!! what kind of veg broth do you use?? …. I dislike most and deperately need to find a new kind! This is so good!! Thanks! if you use nonstick cooking spray, it’s only 2pts, Weight Watcher’s PointPlus per serving (recipe divided by 8) Perfect for my weekly batch of soup. Thanks again! So yummy. Love the herbs!!! This was great to feed a crowd. We added Swiss chard and substituted protabellos and shiitakes. Can I substitute quinoa for the barley? If so, would I put it in at the same time as the barley? Yes, you can! But quinoa will only take 20 minutes to cook. Great Recepie! I modified a little due to what was in my fridge but sooo yummy! thanks! 3 gallons, sampling in 3oz cups. Thanks for your time. Tim Albers. This will be on this weekend’s camping trip fer sher. Need something to satisfy my instead of chewing my nails waiting for the book to arrive!!!! 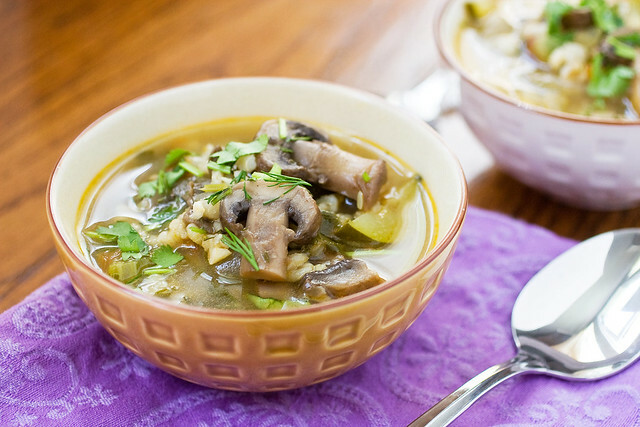 Delicious–I could taste every vegetable in this soup and the flavors harmonized beautifully. This satisfying soup is hearty, complex, and tastes like summer. I think it also cured my hangover. Thanks Isa! Sounds delish! Can it be frozen so I can make it ahead?